Eric Hoenes del Pinal (B.A. Boston University; Ph.D. University of California, San Diego) joined the UNC Charlotte faculty in 2013. Trained as a cultural and linguistic anthropologist, his approach to the study of religion is strongly ethnographic, with an emphasis on the role of language and non-verbal forms of communication in shaping human interaction. His research interests include the study of global Christianity, the politics of language and culture, and the ethnography of Latin America with special emphasis on indigenous peoples of Mesoamerica. 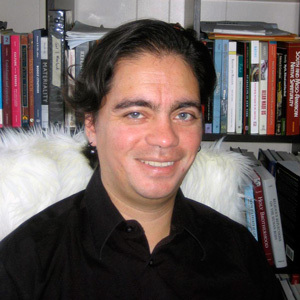 His current research focuses on the role of language and non-verbal forms of communication in driving religious and social change among Q’eqchi’-Maya Catholics in Guatemala. This work examines how congregational differences between Mainstream and Charismatic Catholics are constituted through discourse, how each group’s distinct ritual practices ground their members’ religious experiences, and the stakes that differing forms of religiosity have for people’s social identities and models of cultural citizenship. Cuatro Estampas. The Abeng: A Journal of Transdisciplinary Criticism. 2(1): 61-65. 2018. Returning to the Tzuultaq’a. Anthropology and Humanism. 42(1): 25-27. 2017. A Ritual Interrupted: A Case of Contested Ritual Practices in a Q’eqchi’-Maya Catholic Parish. Journal of Contemporary Religion. 31(3): 365-378. 2016. From Vatican II to Speaking in Tongues: Theology and Language Policy in a Q’eqchi’-Maya Catholic Parish. Language Policy. 15: 179-197. 2016. Notes on a Maya Apocalypse: Eschatology in the Guatemalan Civil War. The Journal of Inter-Religious Dialogue 8: 18-28. February 2012. Towards an Ideology of Gesture: Gestures, Body Movement and Language Ideology among Q’eqchi’-Maya Catholics. In “Beyond Logos: Extensions of the Language Ideology Paradigm in the Study of Global Christianity(-ies),” Special Section of Anthropological Quarterly 84 (3): 595-630. Summer 2011. How Q’eqchi’-Maya Catholics Become Legitimate Interpreters of the Bible: Two Models of Religious Authority in the Giving of Sermons. In The Social Life of Scripture: Cross-Cultural Perspectives on Biblicism. James Bielo, ed. New Brunswick: Rutgers University Press, pg. 80-99. 2009.